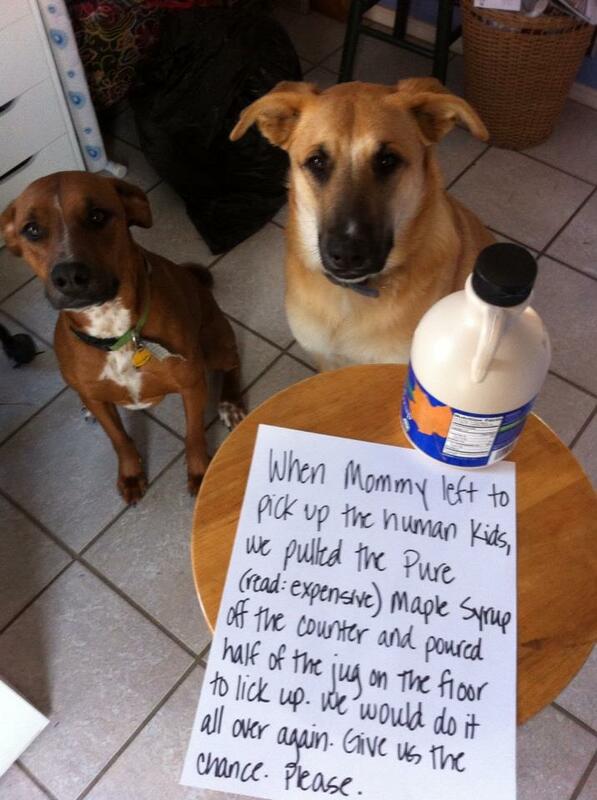 When Mommy left to pick up the human kids, we pulled the Pure (read: expensive) Maple Syrup off the counter and poured half of the jug on the floor to lick up. We would do it all over again. Give us the chance. Please. HOw did they get the cap off? I think they’re waiting on the pancakes…..
Please…give them more! I thought at first the dog on the left looked guilty, but now I think he is just pleading. For pancakes… dogs love pancakes. You must reward them for their perseverance!!! The dog on the left…..do you know what breeds? She/he looks just like one of my babies! Yummy, yummy, its not sticky in the tummy ! Oh geez they are adorable! My two have similar antics!!! What breed is the dog on the left? Redbone Hound Mix? The lid is a flip top, but I’m pretty sure they could chew through steel. They don’t look the least bit sorry lol! MORE, PLEASE! !